In the previous encounter between these two teams, it was Stars who had their upper hand as they won by 8 wickets to spare. But after that they seems to be in all sorts of trouble as currently they are at the bottom of the table. It will be interesting to see they play this match at Melbourne Stadium, Melbourne on 19th January. They will be boosted by the return of their star player Aaron finch who is released from the National squad as the series against India is over. Melbourne Renegades are currently 2nd in the points table and they are looking rock solid in this tournament. In the previous match Kane Richardson inspirational bowling spell help the team to restrict the opposition to a low total and they could chase it comfortably. All the star players of Melbourne Stars have come to their squad. With Maxwell, Stoinis, Handscomb and Zampa returns to the squad they must be high in confidence. They have lost their last 2 matches in a row, so they need to win this match badly in order to compete in this tournament. With all the players back in the squad they are likely to win this match. 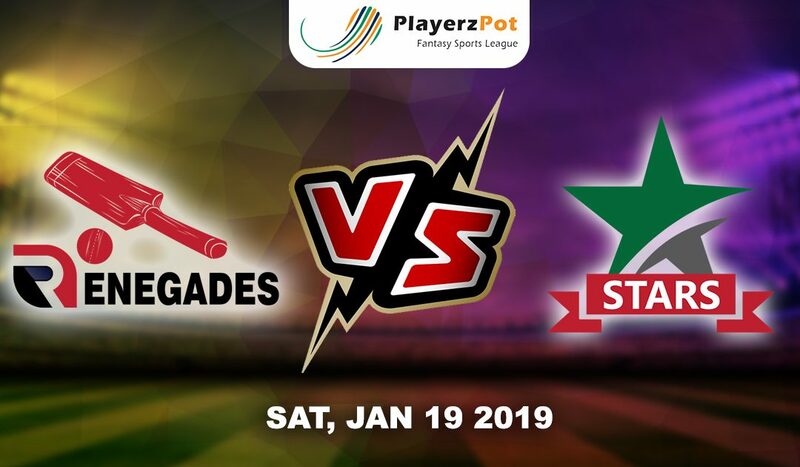 Melbourne Renegade: Aaron Finch (c), Marcus Harris, Sam Harper (wk), Cameron White, Tom Cooper, Mohammad Nabi, Daniel Christian, Jack Wildermuth, Kane Richardson, Cameron Boyce, Harry Gurney. Melbourne Stars: Peter Handscomb (wk), Ben Dunk, Nic Maddinson, Glenn Maxwell, Marcus Stoinis, Seb Gotch, Dwayne Bravo, Liam Plunkett, Adam Zampa, Jackson Bird, Tom O Connell. Although Stars are at the bottom of the table but with all their star players back in the squad, they will be tough to beat.